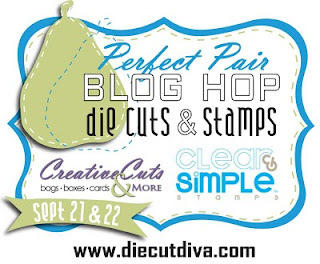 Perfect Pair 2-day Blog Hop. 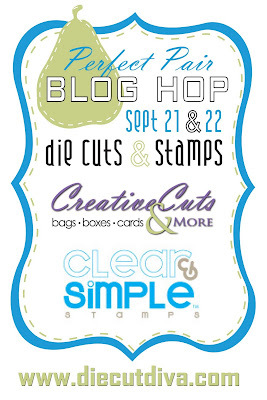 Clear & Simple Stamps design team for this special 2-day blog hop!! This romantic little box would be a wonderful favor to give away at a bridal shower, a wedding rehearsal, or an anniversary party. The soft blue flower is something I created by using the mini heart die cuts from Creative Cuts and More. I simply arranged and stacked them until I was satisfied with the floral shape. Then I punched out some small circles and glued them together. I added some gorgeous gold glitter to the circles and adhered that to the middle of my flower. I highly recommend using the 1/4" Killer Red Tacky Tape to assemble this box and its matching lid. I've tried using ATG tape (tape gun) and the edges just pop open after a few minutes. I assembled this box back in June and it is still stuck together with no signs of coming apart. 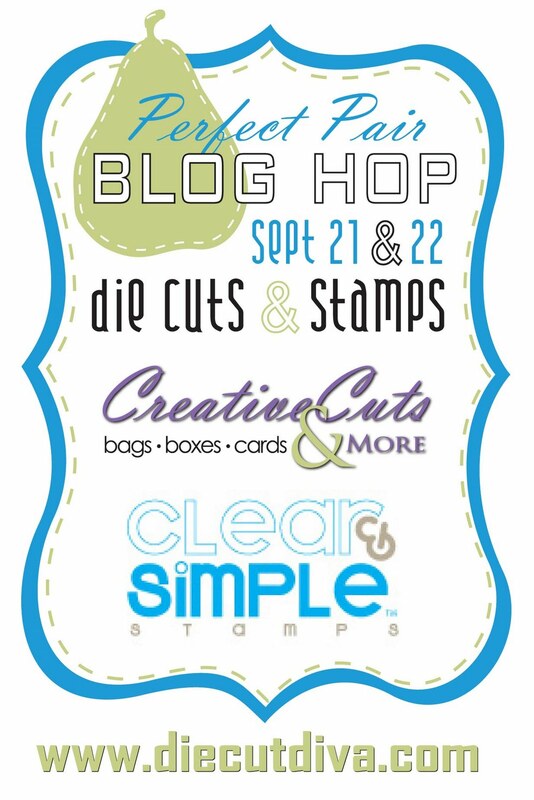 Just a little reminder - join us for our special joint blog hop featuring CC&M die cuts and Clear and Simple Stamps on September 21 and 22. 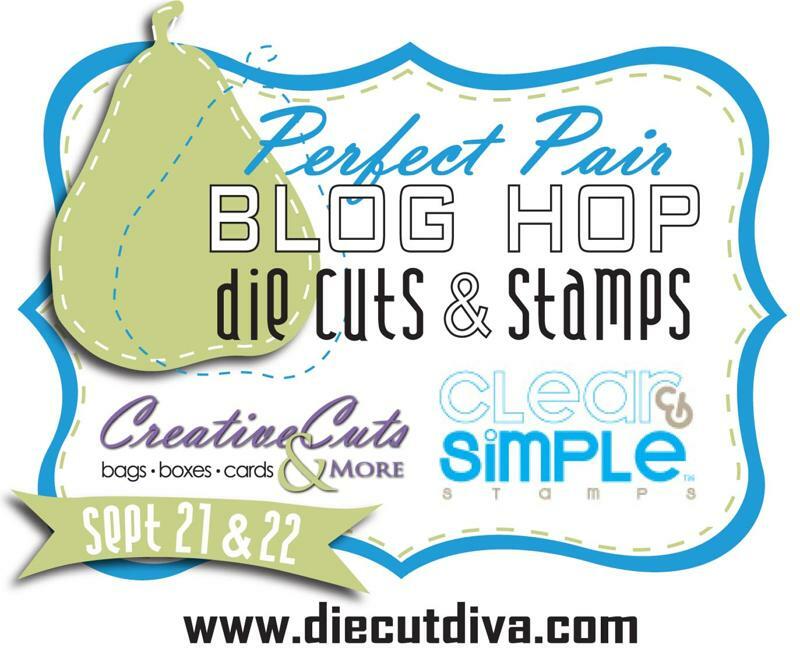 This will be an awesome display of die cuts and stamps that you don't want to miss! A quick and easy gift! Hello Everyone!! It's Noelle posting today! I am so in love with the Card Portfolio! 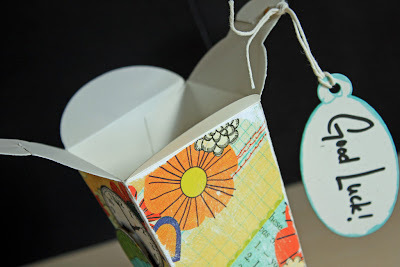 It is so easy to put together and makes a super nice gift! I had everything cut in Stardream Chiara, this paper is so beautiful and shimmery. I seriously can not get enough of it! It will hold 6 A2 cards! I only made 4 because I made matching envelopes with liners. I used a lot of labels. I LOVE all of Creative Cuts label dies. They make such nice embellishments! The brads, buttons and ribbon are from my stash. The stamps are all dollar stamps from Studio G or Inkadinkado! Thanks so much for stopping by today! Kim's here again from The Scrap-a-Teeny Girls to show you what she did to embellish some of the dresses on her acordian wedding album made from the Scalloped Dress Cards at Creative Cuts & More! So simply embellished! For all the dresses in the album, she picked pieces of elegant patterned paper to place on the inside of the cards. On this one, she ran a string of pearls along the waist & bottom of the dress! Adorable!! On the next one, she placed a row of silver pearls along the bust & randomly on the skirt pattern. But the most adorable part is along the skirt bottom, where she punched tiny hearts out in a charcoal grey put them on the dress upside down & added the pearls again along the tips. Now, what could be more simple than a row of chiffon ribbon with pearls along the bottom on this next one? Plus the paper she chose with the cherry blossoms looks beautiful with the pearls placed in the center of the flowers! The ideas on the album could easily be adapted to make a set of Bridal Shower invitations or thank you cards or do what Kim did & make a beautiful acordian album out of several cards! If you'd like to see more of the album's pages & close-ups, simply visit our blog today! 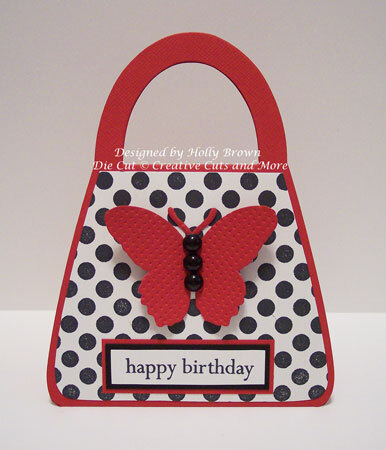 How about a great birthday purse card for a fashionable lady?? Isn't this fun? 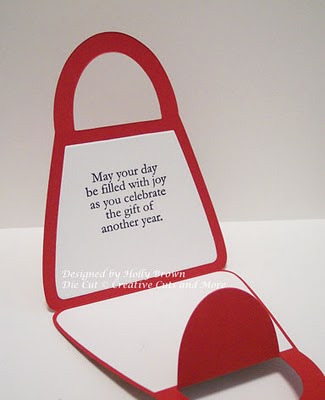 These A2 Purse Cards from Creative Cuts and More are a cool alternative to the regular ol' rectangle cards we normally give to our loved ones. I had a blast decorating this card. 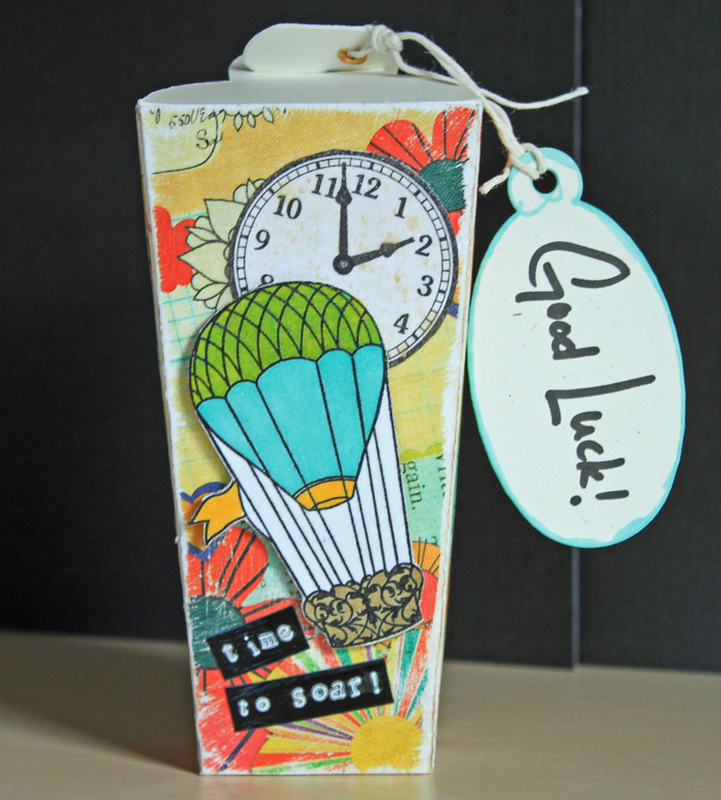 I stamped the white layer with a large polka dot background stamp with black ink. Then I cut out the butterfly and embossed it for a little extra oomph before adding some black skittles to the center. The sentiment needed a little extra color to help it stand out from the polka dot background, so I used a black layer and then a red layer. For the inside, I stamped the sentiment toward the top so there is some room for me to sign my name below. I thought we could revisit some of my favorite projects from the past! 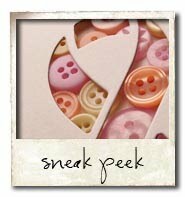 Maybe you've missed a Blog Hop or two, then this will be a special treat just for you. Here's one of my favorite Holiday projects from 2009. I had to revisit this awesome Halloween banner. My teenage niece will be moving to Chicago from Park City, UT next week with her dad & his new wife. I know that it is a great opportunity for her, but being a teenager, she can't always see that. So, I made her this little box & filled it with inspirational quotes - some silly, some thought-provoking or just some to make her smile - while she makes this huge transition. She was very touched by it & I hope that it helps her along the way to remember how much we all love her! 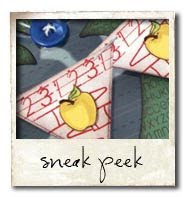 First, I traced the "panels" of the box onto the "Handmade" paper from the Sweet Marmalade line from Sassafrass Lass. Originally I was going to just score the paper like the box & cover it, but as I was playing with it, I decided to tear along my scores instead & adhere each piece with the Killer Red Tacky Tape. I was super pleased with the look! I stamped a clock onto white cardstock, Glimmer Misted it w/"Wheatfields" mist. 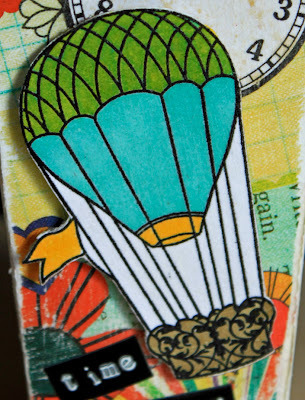 Stamped another piece of white cardstock with the hot air balloon stamp (from Shabby Green Door), embossed it w/clear powder & colored it in with my Bic acid-free markers. 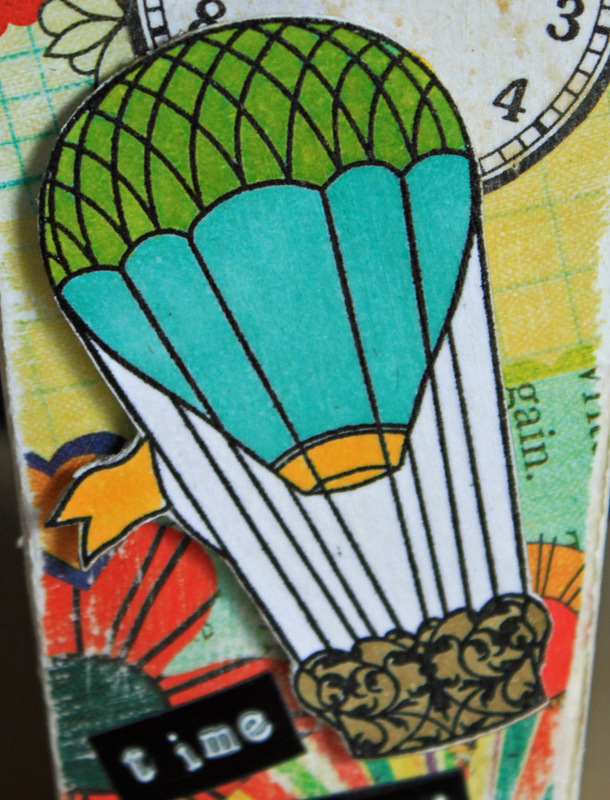 Then I glued the clock onto the box, popped the balloon & typed out "Time to Soar" on my Dymo label maker. When it was all assembled with the Killer Red Tacky Tape, I went over the entire box with Liquitex Gloss Gel Medium to "seal" the box & make it more sturdy in the hopes that it would last longer for her. Lastly, I put a little eyelet in one of the tabs on top to attach the gift tag & filled it with papers containing the quotes I found online. That's it! A simple little box of smiles! Popped the back of the hinge & viola! Instant butterfly! Stay tuned for next week when we will post another idea from this fabulous album! Hello!!! Please contact customerservice@creativecutsandmore.com to receive your Gift! Beautiful wedding ideas for cards or scrapbooking. Love all of them. Please collect your prize within 7 days or we will choose new winners! Thank you for HOPPING along with us!!! Have a GREAT day! Hello Everyone- We are so thrilled to have Melisa Waldorf as our Guest Designer... Here is a post from her blog... If you have NOT stopped there, you really need to check it out! You can see her BLOG HERE. Good Morning! August 1 was the beginning of my fun Guest Designer gig with Creative Cuts and More and my goal is to show you how awesome and easy these products are. Creative Cuts and More sells pre-cut/pre-scored die cuts. There products range from simple image die cuts to AWESOME 3-D templates to pre-cut mini albums, and much more!! If you have ever wanted to create 3-D boxes or bags, this is the way to go. All you have to do is fold along the scored lines and adhere. She carries a HUGE list of colors for you to select from. And why am I so excited?? Because I have always secretly admired all those cool boxes and bags over at SCS, but was to lazy to try it! 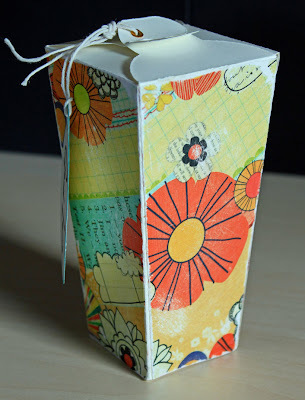 This project is a Cupcake Box. Perfect to drop off on a co-workers desk or give to a friend. It comes with this cool insert to hold the cupcake in place and an acetate window. I put together my box and began embellishing. I decided to cut panels in a lighter shade of pink and run them through the cuttlebug with an embossing folder. And then I distressed with pink ink that matched the box. Then I glued the pom-pom fiber around the edge of the lid. Now another great option would have been to stamp the box, but keep in mind that you would have to do that before folding. These cards come with different shaped windows for you to choose from. The pink glitter on the icing on the inside didn't really match, but you get the idea. And as you can see, I lined up the cupcake on the inside so that it is not visible from the outside. To create the embossed front of the card begin with a rectagular piece of cardstock that fits just inside the card front, leaving a border. Mine is 4 x 5 1/4. Run it through the Big Shot using an embossing folder of you chose. I started with 2 pink and 2 white. Cut the icing tops away from 1 of the white and 1 of the pink switch them up, layering the white icing over the pink die and vise versa. Now your pink cupcake liner will have a white icing and vise versa. DO NOT GLUE them down until you have stamped the liners. Stamp both the liners with a decorative stamp. I chose polka dots. Ink edges black. Color both candles black. Cover the pink flame with white pigment ink. Apply adhesive to both flames and sprinkle with glitter (Stampendous). Now adhere the white cut out icing on the pink cupcake and vise versa. I used Liquid Applque on my white icing but didn't like how it looked. So I applied adhesive (Aleene's Tacky Glue) and sprinkled with glitter. I did like that it was raised though. The dimension looks really cool. I should have used my Puffy Paint (local craft store) instead of the Liquid Applique. It would have been smoother and more like real icing. Apply adhesive to the pink icing and sprinkle with glitter. I used pink and it doesn't really match, I should have stuck with the white, because I think the pink would have still shown through the glitter and matched better. I used a piece of the lighter pink cardstock to create the label on the inside. I placed it inside the card so I could plan the positioning of my sentiment. I centered it up and helped to keep it in place by putting a small strip of tape runner on the back of it. I was afraid I would mess up the sentiment, so that's why I waited to adhere it down. Close the card. Choose a birthday sentiment and slide your cupcake over the front to figure out the best position. Stamp your sentiment. If you got it right the first time, great (I had to do it twice). Now you can adhere that inside label. And adhere the cupcake to the outside. Now you can slide the cupcake on the inside of the card until you get it directly under the one on the outside. Glue it down to the inside of the card. Please stop back by this month to see all of my Creative Cuts and More projects. If you miss one, go to the labels on my side bar and click on Creative Cuts and More. This will bring up all my projects using their products. Thanks for stopping by and I hope you have a blessed day! Hello everyone! Kayla here with another mini album to share with you today! My brother-in-law recently got married. I instantly knew his fiance and I would get along great. I wanted to do something special for her bridal shower. I decided to make her a recipe album. This is the Mix & Match album. 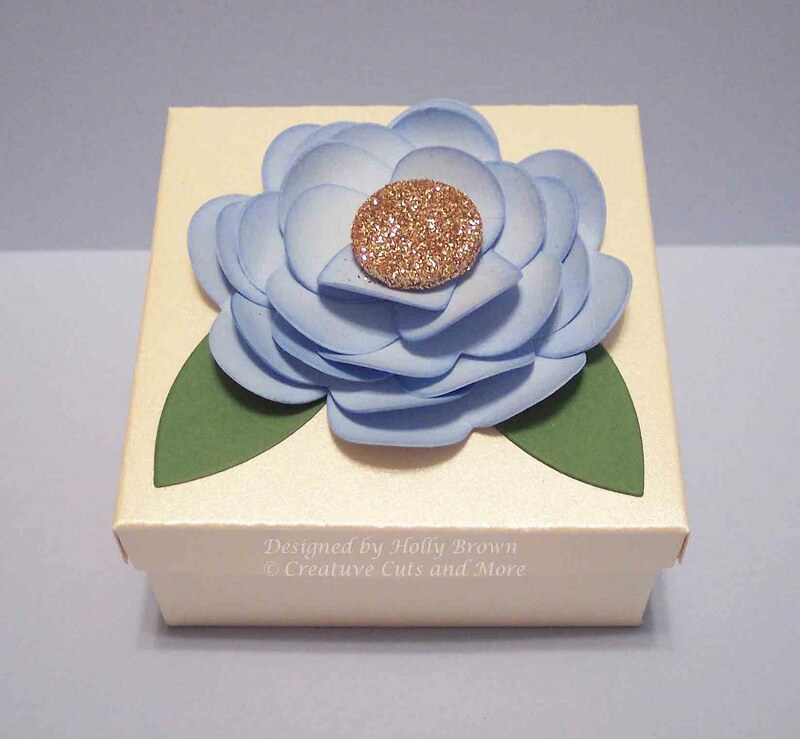 I used Jenni Bowlin Crate Paper and a button to create the flower. I stickled the flourish and added the Antique Label. I added tag shaped pages in between the mix and match pages. The inside of the cover is a pocket for more recipes. I used the hinge die cut on this page. I googled free recipe cards and printed them off. Here I used the Scallop Circle Frame in tacky tape and covered it with Doodlebug Sugarcoating Glitter. I also used more hinges and Doodlebug rhinestones. A close up to show the glitter and rhinestones. I used Smooch on the hinges that were cut out of chipboard. On these pages I used the Antique Elegance Frame, Scalloped Circle Frame and more rhinestones. And finally the last page. I used more hinges and created another pocket to store more recipe cards. This was so much fun to make! Thanks for stopping by! BABY & BRIDAL SHOWER BLOG HOP! Welcome to the Baby and Bridal August Blog Hop for Creative Cuts and More! You are in for a GREAT treat! Our Designers are very excited to share some beautiful Bridal and Baby shower or wedding or gift ideas with you. This wonderful ideas are PERFECT for your special Celebrations! Don't forget on the NEW website have over 100 NEW Die Cuts AND a NEW section called GREAT DEALS! Once you are finished HOPPING along the Blog Hop, you will have an opportunity to win one of the WONDERFUL two tier cake in their choice of a smooth or textured cardstock. You can see some ideas with the cake HERE and HERE . (D) Leave one extra comment if you click over to our new page on Facebook and become a fan. 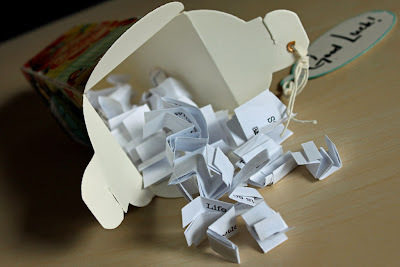 (E) Leave one extra comment by commenting on ALL of our talented Designers in our Blog Hop! Your chance to enter to win will have a deadline of Sunday, August 15th at midnight! I will announce the winner on Monday, August 16th. The first projects I will be sharing are from the very talented Joan Ervin. She was our Guest Designer for the month of June. These are just a few of the wonderful die cuts from Creative Cuts & More and they are all just perfect for a bride!! The card is a 5x7 size with the little dress cutout window. Joan added some lace to a piece of scrap white paper and then taped it to the backside of the window. A cover piece will cover the inside. The flower corsage consists of sheer ribbon, silver cording, and the sugared rose from Prima. The Slice Tag Maker heart rims are by Making Memories and the sentiment is from Papertrey Ink's Simple Little Things. A pearl flourish and the silvercording and pearl on the dress finish it off. 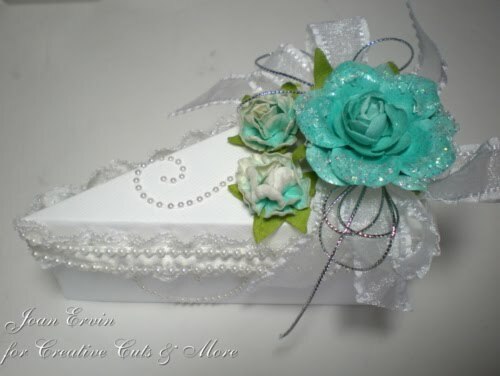 The corsage on the cake slice was created like the one on the card. Pearl trim and pearl flourishes were also added to the sides and top. The is the cutest little box that opens in the back and would be perfect for wedding favors or bridal shower treats. The little dress and tuxedo boxes are just so adorable...wouldn't they look cute as favors on the guests tables, as decorations on the guest book table, or even on the food tables....toooo fun!!! Kim from the Scrap-a-Teeny Girls really out-did herself this month! (Of course it helps that she attended a fun wedding in Napa recently!!) Look at this wonderful wedding ensemble she created! 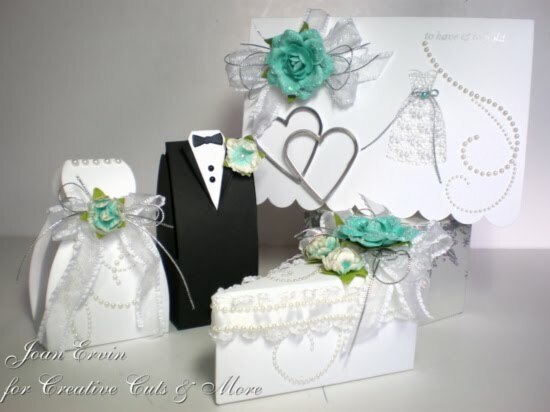 An adorable little box that could be used for momentoes or favors, a sweet wedding card & an amazing album!! All with the great dies available at Creative Cuts & More!! Instead of mounting her color block items on the inside of the card, Kim decided to mount them all on cardstock first and then place them inside the card. This allowed more space for her sentiments inside! This is the wonderful Bride & Groom silhouette die that comes in 2 sizes (not on the site yet, just contact Terry if you are interested in some of these!) in any color you want! 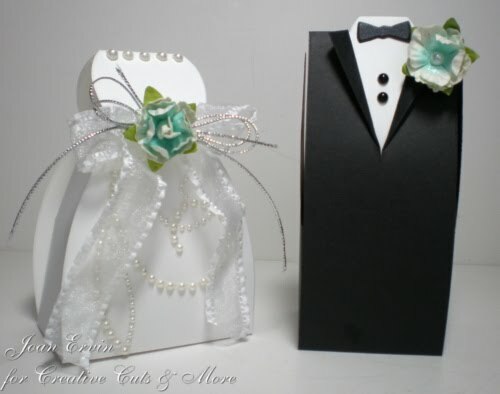 After that, Kim created this adorable little box using the Dress Window Square Box #01 by covering the dress cut-out on the inside with some pretty patterned paper; embellishing the dress with pearls. After assembling the box with Killer Red Tacky Tape, she attached the 3 fabric flowers from her stash. Finally, she worked on the album. Now, this is no ordinary album! It is actually FOUR of the Dress Window A7 Scallop Cards linked together!!! After adhering the edges of the cards together in such a way as to form an accordian, Kim began to place her photos, stickers, DIES embellishments! It really is a wonderful album; a great keepsake for years to come!! 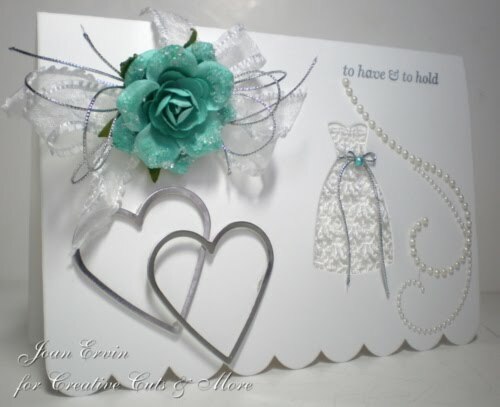 The dress card also comes in several other sizes layouts, as well as a 6x6 or 8x8 Album from CC&M! There really are so many amazing dies to choose from for any of your projects & remember to "think outside the box!" You never know what kind of creative concoction you might come up with!! Do you want to see more??? Do you want to learn how Kim embellished a couple of the dresses on the Cards or how she used a Hinge in such a clever way? Well, you'll just have to check back here next week for more!!! Have fun and don't forget to come back for your chance to win!